Ramissio Energy is an organic tablet packed with caffeine. 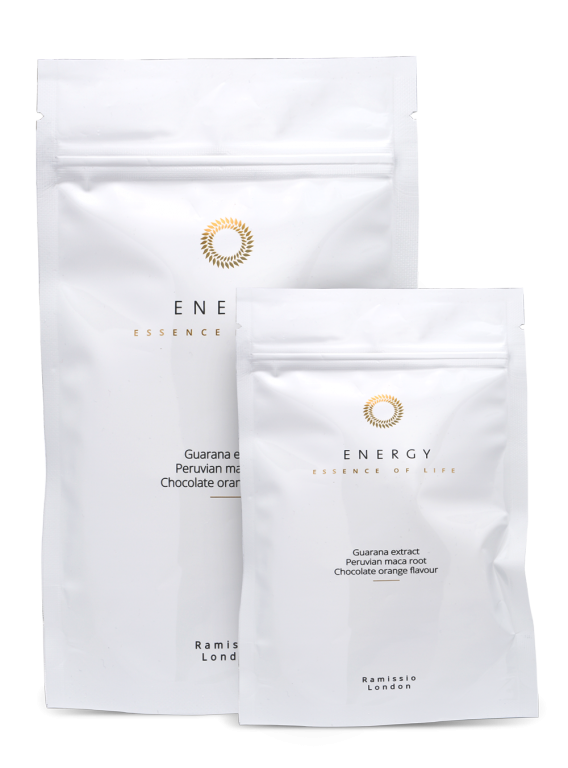 It contains a combination of guarana and maca, rare plants from the Amazonia jungle. Their incredible effects were discovered by South America Indians who gained energy, power, and endurance from them. Besides, Ramissio Energy boosts immunity, fights anemia and helps during the menopause and osteoporosis. Its caffeine amount is several times higher than in coffee beans and that’s why it prevents tiredness, improves concentration and stimulates the mind. Ingredients: Guarana powder (477 mg), cane sugar, fructose, tricalcium phosphate, citric acid, cellulose, Maca root powder (55 mg), chocolate flavour, stearic acid, stevia, orange aroma, magnesium stearate. Instructions: Take 1-3 tablets daily. Allow the tablets to dissolve in the mouth or chew them up. Store the sealed container in a cool and dry place. Not suitable for children under 3 years. Not suitable for pregnant or nursing women. Keep out of reach of children. This product is not intended as a dietary substitute. Do not exceed the recommended daily intake. The product contains caffeine.